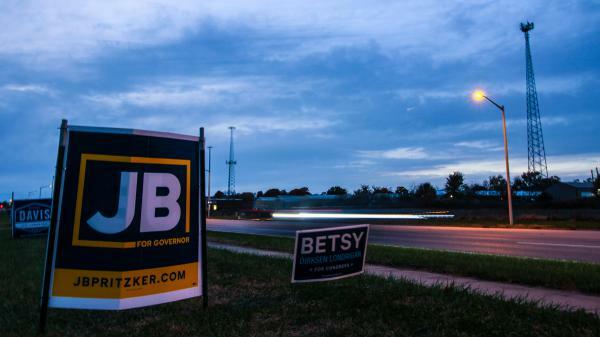 Cars pass a sign for gubernatorial candidate J.B. Pritzker about an hour before the polls closed on Nov. 6, 2018. A day after defeating incumbent Bruce Rauner, Illinois Gov.-elect J.B. Pritzker is beginning his transition into government. Pritzker’s transition committee includes labor leader Michael Carrigan, head of the Illinois AFL-CIO, and two former state officials: Democratic Comptroller Dan Hynes and Republican Gov. Jim Edgar. In an interview scheduled for broadcast Thursday (Nov. 8) on The 21st, Pritzker said he hopes Edgar’s presence will demonstrate his bipartisan intentions. “After all the rancor and the unwillingness to work together I think it’s time that we actually started talking across the aisle — Republicans and Democrats — because we’ve got some real challenges in this state and we can only get things done for working families if we work together,” he said. Pritzker also told The 21st he hopes to sit down with Rauner — a man his campaign relentlessly attacked as a failure. Pritzker is bringing campaign manager Anne Caprara into government as his chief of staff. Before the last two years leading his successful run in Illinois, she’d worked with the Democratic Senatorial Campaign Committee, the pro-Clinton super PAC Priorities USA, and as the top aide to two Congresswomen. This will be her first job in state administration and the executive branch of government. Pritzker assumes office on January 14, 2019. His agenda includes moving the income tax to a sliding system where the wealthy pay more, restoring vocational training in high schools, and opening up state health insurance to everyone in Illinois.